Victoria Sinitsina / Nikita Katsalapov comment on their performance in the short dance at World Championships. It’s your debut at the World Championships. How difficult is it to start at this tournament? Victoria: It’s a pleasure to perform. The atmosphere like at home. The fans helped. Here are a lot of fans from Russia – screaming, cheering. It was very pleasant to skate. Nikita: A huge plus that we don’t feel acclimatization and a double plus that we are well prepared. The third advantage is the quality of the ice and the organization of the World Championships – a very high level, so it was it was a pleasure to skate. Did you feel more pressure, because there are only two Russian dancing pairs in this tournament, and pair Ekaterina Bobrova – Dmitri Soloviev also couldn’t come to Boston? 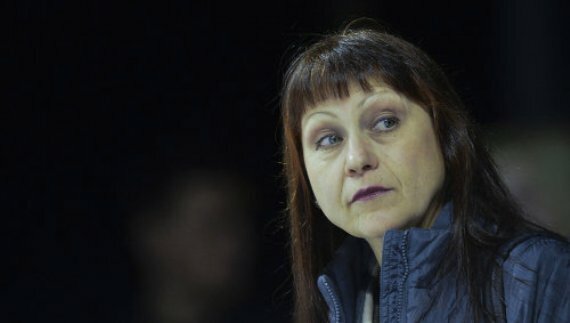 Nikita: First of all, to accomplish the task, so next year to the World Championship can go three Russian pairs, we have to skate clean and precisely. We did the maximum that could for today. Good luck to Sasha and Vanya (Stepanova – Bukin – ed. ), wish them to skate well today. Of course, three our dancing duos should go to the World Championships. Isn’t it sad that during the performance of dancers the stands were half empty? Nikita: I think it is still very early, and when the Shibutani will skate, here will be more viewers. Victoria: Yes, and for the free dance will come more fans. As for the half-empty stands, the stadium is very large and it’s hard to fill. Nikita: But we saw 20 Russian flags, and there was an impression that lots of people came to cheer for us. For the first half of the day such amount of spectators at this rink it’s normal. All shouted, supported. Great! Marina: Very pleased with Victoria and Nikita’s performance. On the one hand, it’s difficult to perform in the early warm-ups, and on the other, maybe you feel freer. At least, the performance showed that they probably got the right starting number, as the performance was good. They showed the maximum they can for this moment. About the judging – scores were high. We got a second level for the step sequence. We all – three coaches have discussed, and to be honest, didn’t see what was the problem. The second level – it should be noticeable. But experts know best. After the competition, we’ll ask what happened and will make conclusions for the future. At other competitions we got higher level for this step sequence and, and now the guys performed it more confident. We have worked very hard. But perhaps, the second warm-up has affected, that it wasn’t fifth or sixth. But in general, I liked the performance. I liked the way the guys spentthe trainings here. No mistakes. You know, sometimes there are some nuances, but now everything went perfectly on a level that Victoria and Nikita have. Here they did everything they should have done. Most importantly, the athletes have learned how to manage the energy of emotions and to send it into the right direction. It was probably the best performance of the season. Now we’re waiting for the free dance. Tessa Virtue and Scott Moir were sitting on the stands, they were watching the performance very carefully. Marina: Of course, they watch my programs. I hope they really liked it.